Kids Artists: Let it snow! I found the idea of printed snowmen in one of Usborne's activity books. With music lines, I made my own lesson of it. Draw curved music lines with a white or silver pen on the black sheet. Put a piece of paper towel on a saucer so it can serve as a stamp pad. Drip some tempera paint the paper towel. Use your thumb to stamp the bodies of the snowmen. Add a fingerprint for a head. When the paint is dry, you can add eyes, nose, mouth, arms, buttons etc. Use gel pens and markers. 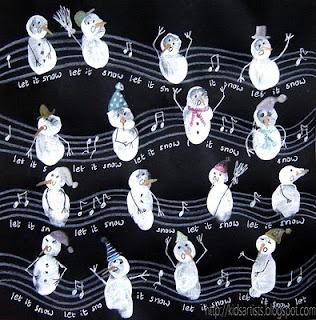 Draw some music notes on the lines and write the lyrics of a winter song belof the lines. This is very beautiful, music with art! Our music teacher will think it's great. I'll be showing this to her today. Thanks! I guess the music teacher will have some comments on the place of the music notes!! This is pretty clever!! It would make a great greeting card, too! These are SO cute! I did this with my first grade today and used round sponges with white tempera paint. They loved it! Thanks for the FUN idea!! So cute! I think I'll use this idea in my kindergarten class... Thank you! Today I had a brother and sister each make one of these on square boards to be framed for their grandparents. They loved doing it and the result was lovely. Thanks for the great idea! Come on, let's make a snowman!